Conference Calling is a AT&T Office@Hand feature for all Office@Hand plans. 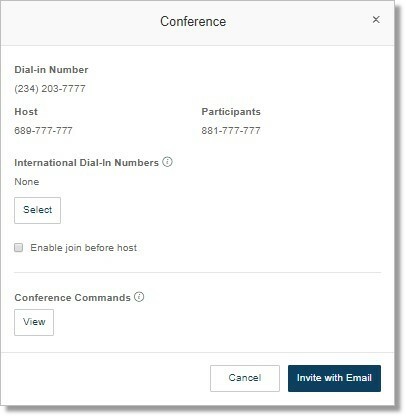 This will enable you to setup and join ad hoc (reservation less) conference calls anytime, anywhere. Each AT&T Office@Hand customer will receive a Conference Bridge Number and a unique Participants Access Code to join a conference. The local Conference Number, and the Host and Participants Access Codes can be viewed in your online account. On your AT&T Office@Hand Online account, click the Conference icon. On the Conference screen, you will see the Dial-In Number, Host, and Participants codes. If you have international participants, you can Select the applicable countries under International Dial-In Numbers. The phone numbers will be added to the email invite. the host does. Otherwise, leave unchecked. On the email invite, enter your participant’s email addresses, then click Send. See Conference Calling Touch Tone Commands for a list of available commands.